China’s 13th Five-Year Plan (2016-2020) is still in the early planning stage, but @JimConca has just posted an outline of the ambitious nuclear plans at Forbes. Jim sees 350 GW and “over a trillion dollars in nuclear investment” by 2050. Near term to 2030 China plans to build seven reactors per year achieving 150 GW total generation by 2030. Jim concludes that China seems to be commissioning new nuclear plants for roughly 1/3 of US costs. It seems as though 5 years and about $2 billion per reactor has become routine for China. If that can be maintained, then China will be well-positioned as the world’s nuclear energy leader about the time their middle class swells to over one billion. From Mark’s reports I learned that one of the presentations was by a key figure, Xu Hongjie of the Chinese Academy of Sciences (CAS) in Shanghai. Hongjie is the director of what China dubs the “Thorium Molten Salt Reactor” (TMSR) project. One of his slides is shown above, presenting an overview of the TMSR priorities (left side) and the timelines. Happily the Chinese are also focused on the process heat applications of the PH-AHTR (hydrogen to methanol etc.) and the huge benefits to a water impoverished region like China. The Chinese are demonstrating systems-thinking at scale. TMSR-LF or liquid fuel, which I gather is similar to popular LFTR concept. Both designs are derivative of the Weinberg-driven Oak Ridge (ORNL) molten salt reactor program (that was cancelled by politicians in the 1960s). I understand the PB-AHTR to be most ready for early deployment, which will lay critical foundations for the liquid fuel TMSR-LF (LFTR) implementation a decade or so later. UC Berkeley’s Catalyst magazine has a very accessible summary of the PB-AHTR program. The United States could be leading the global nuclear deployment. But so long as the Big Greens are running the show that won’t happen. The good news is that once the love affair with solar/wind/gas collides with reality, then the US can get in line for low-cost, advanced Chinese nuclear technology. Why does China achieve most of its energy goals? 1. “Sandbagging”: i.e., set really easy goals. 2. Bottom-up planning: consider in detail how you will go about achieving a goal before you commit. In particular, budget the resources needed to achieve the goal. My thesis is that China does a lot more of #2 than typical Western democracies. Kyoto is an excellent example of setting goals with no plan. Those are meaningless goals – simply political gestures. This article was originally published in Chinese in the March issue of China Policy Review. The strategies that raise a country from poor to middle-income status will not work to raise it from middle-income to rich. Economically, there is no reason to expect the strategies to work. Poor countries have very different capital stock, labor productivity, land utilization, and capacity for innovation than middle-income countries. Unfortunately, old policies seem politically easy or are even perceived as a source of social stability. Many middle-income countries try to become rich by sticking to a development model that no longer works. This is the middle-income trap. The middle-income trap makes the concept of “the new economic normal” in China a very valuable one. Chinese policymakers, business owners, workers, and farmers must understand that the old development model is changing because it must change. However, introducing the idea of a new economic normal is only the first, small step. It must be implemented with new and appropriate economic policies. Increase competition, not cooperation, in the corporate sector. Give farmers sharper rights to their land, as the original reforms did in 1978. Rapidly integrate labor markets, so a shrinking workforce is more productive. Dramatically slow or halt the accumulation of debt to avoid stagnation. Source Making the new normal meaningful. I’m seeing increasing optimism that China’s leaders are incrementally implementing climate-positive policies. These are policies that violate Roger Pielke Jr.’s “Iron Law”. While I’m reading the current 5 Year Plan, and going through my notes on policy hints, I found this June Bloomberg piece which closes with these comments on possible carbon taxes as well as coal and carbon caps. At the moment, while the ETS is being piloted, the Ministry of Finance (MOF) is also studying the possible implementation of carbon taxes. Yang Fuqiang said the National Development and Reform Commission favors the ETS system and the MOF the tax system, but it is uncertain which will be the leading policy in the end. According to the CNS report, He also said nonfossil-fuel-based sources are expected to reach 15 percent in 2020, to reach 20 percent to 25 percent in 2030, and to hit 33 percent to 50 percent of the energy mix by 2050 in China. Text of a speech by He given at a Low Carbon Development Forum at Tsinghua University in March shows he is in favor of setting caps on coal consumption and carbon emissions beyond the carbon intensity targets that have already been set, to “give stronger binding targets to promote the transformation of the current economic growth model,” but He did not suggest any policies had officially been set by the central government for the next planning period. In mid-March 2011, the National People’s Congress (NPC), China’s top legislature, approved the new Five-Year Plan (FYP). China’s FYPs are blueprints which outline key economic and development targets for the country for the next five-year period. The Plan is essential reading for businesses seeking to either expand their existing Chinaoperations or position themselves in the market for the first time. For over two decades, the United States and Europe have been trying to integrate Russia into the international order. This post-Cold War strategy yielded some success, but has now come crashing down over following Russia’s aggressive turn and the ensuing crisis over Ukraine. The United States is seeking to isolate President Putin while Russia is trying to distance itself from what it sees as a Western-dominated order. President Obama says this is not the beginning of a new Cold War, but a new era seems all but inevitable, with potentially severe consequences for the global economy, counter-terrorism, the non-proliferation regime and climate change. On August 20, 2014, the Foreign Policy program at Brookings hosted a discussion on what Russia’s foreign policy turn means for the international order and for U.S. foreign policy. Thomas Wright, fellow with the Project on International Order and Strategy (IOS), moderated a conversation with Brookings President Strobe Talbott, Senior Fellow Clifford Gaddy of Brookings’ Center on the United States and Europe (CUSE) and Susan Glasser, editor at Politico Magazine. There is an uncorrected transcript [PDF]. How can the developing world escape poverty without climate change calamity? Schalk Cloete’s superpower is the ability to execute and explain exactly the analysis required to penetrate a difficult, controversial topic. And there are a few others – you know who you are. The reason I posed this in terms of three different developing countries is because the support & partnership that the rich countries can offer is different in each case. China is already putting more resource than any other nation into building up their nuclear deployment capability. Even so, China can benefit hugely from without-limit contributions of capital, science, and engineering know how. I left regulatory know how off that list, though there may be possible contributions there. As it stands today the US NRC is probably mostly a hinderance to the deployment of advanced nuclear – not because of the NRC staff, but because of the budgetary straight-jacket imposed by the US Congress (make the ‘customers’ pay for everything up front). India is improving their nuclear deployment capability at a slow, deliberate pace. But India too could benefit from external technology contributions. Remember that India was cut off for decades from western nuclear tech as punishment for their indigenous nuclear weapons development. Africa needs affordable energy-machines that are suitable to their infrastructure and operational capabilities. If Africa does not have access to affordable and suitable nuclear they will have no real choice but to build more and more coal and gas. Our affordability challenge is that we need to offer clean, reliable electricity at the best price per ton CO2 avoided. So what can compete economically with coal and natural gas? If you study Schalk’s chart for a few minutes I think you will conclude, as I have, that we need to pull out all the stops to accelerate deployment of mass-manufactured “nuclear batteries”. By “batteries” I mean simply that no-maintenance energy-machines that can be rapidly installed by underground burial, connected to the grid, then left alone for up to four decades until the maintenance crew arrives to replace the “battery”, trundling the original off to the factory for refueling. China is training-up to build and staff Western-style plants like the AP1000 – which China will be building internally on Chinese-owned IP. That is not going to happen very soon and at scale in Africa. While my guess is that India will need some time to develop their skill-base and supply chain. Sadly, Greenpeace has succeeded in preventing availability of the simple plants that Africa wants to purchase. Given the reality of the nuclear supply chain, it will be close to two decades before vendors are manufacturing and installing plants suitable for most low-tech nations. Africa isn’t waiting for someone to make a clean generation option available to energize their growth. Currently seven of the ten fastest growing economies are in Africa. Sadly the massive scale of African urbanization and growth is going to be enabled the same way it happened in Europe, N and S America – building relatively cheap coal and gas plants as fast as they can be built. That trajectory will end very badly unless we get serious about what happens next. We can create a happy ending if, inside the next two decades, we achieve the capability to produce affordable nuclear plants that can be installed and operated without losing two additional decades developing a deeply-trained nuclear workforce and local supply chain. By 2015 Africa’s urban population is expected to triple [UN World Urbanization Prospects: The 2011 Revision]. It’s obvious that these SMR designs must be substitutable for the fossil thermal machines that got built in the first phase of dirty industrialization. It will be a lot easier and cheaper if the first-stage dirty plants are designed for such an evolution: rip the dirty heat out, stick the clean heat in. There’s heaps more to be learned by studying Schalk’s essay, so get on over there. If you find any flaws in his work, please contribute to the dialogue there on TEC (I am subscribed to those comments). Footnotes from Shalk’s essay: why China’s nuclear avoidance potential is actually greater than the above chart. It should also be mentioned that the Chinese tariff system favors wind over nuclear by paying a fixed feed-in tariff of $83–100/MWh to wind and $70/MWh to nuclear. Another important factor to consider is the reduced value of wind relative to nuclear due to the variability of wind power (see my previous articles on this subject here and here). Wind power also requires expensive high voltage transmission networks to transport power from good wind locations to population centres, something which is creating substantial challenges. Thus, if the playing field were to be leveled, the difference between nuclear and wind scaling rates should increase substantially. This notice was just emailed by Stewart Brand to Long Now Foundation members. If you are not a member you can purchase tickets for $15 each. The NSA’s failures are public headlines. Its successes are secret. These days America’s National Security Agency lives at the intersection of two paranoias—governmental fears of attack and citizen fears about loss of privacy. Both paranoias were exacerbated by a pair of devastating attacks—9/11 and Edward Snowden. The agency now has to evolve rapidly while managing its normal heavy traffic of threats and staying ahead of the ever-accelerating frontier of cyber capabilities. In the emerging era of transparency, and in the thick of transition, what does the NSA look like from inside? Threats are daily, but governance is long term. At the heart of handling that balance is Anne Neuberger, Special Assistant to NSA Director Michael Rogers and Director of the Commercial Solutions Center. (Before this assignment she was Special Advisor to the Secretary of Navy; before that, in 02007, a White House Fellow.) She is exceptionally smart, articulate, and outspoken. “Inside the NSA,” Anne Neuberger, SFJAZZ Center, Hayes Valley, San Francisco, 7pm, Wednesday August 6. The show starts promptly at 7:30pm. • Long Now Members can use the discount code on the Neuberger Seminar page to reserve 2 free seats. • You can purchase tickets for $15 each. • Tune into the live audio stream for Long Now Members at 7:30 PT – become a member for just $8 a month. [The] Idea that when people go to the polls they are knowledgeable is ludicrous. What’s the point? The problem is concentrated benefits, diffuse costs. A smaller government is less likely to do harm than a bigger government. It is impossible for voters to know what the federal government is up to. In practice they do not know the impact nor effectiveness of what competing politicians are proposing. A smaller government presents less opportunity for politicians to divert taxpayer’s earnings to pay off supporters (pork). A smaller government presents less opportunity for rent-seeking by interests that influence government to provide them special benefits. (…) In modeling the behavior of individuals as driven by the goal of utility maximization—economics jargon for a personal sense of well-being—economists do not deny that people care about their families, friends, and community. But public choice, like the economic model of rational behavior on which it rests, assumes that people are guided chiefly by their own self-interests and, more important, that the motivations of people in the political process are no different from those of people in the steak, housing, or car market. They are the same human beings, after all. As such, voters “vote their pocketbooks,” supporting candidates and ballot propositions they think will make them personally better off; bureaucrats strive to advance their own careers; and politicians seek election or reelection to office. Public choice, in other words, simply transfers the rational actor model of economic theory to the realm of politics. Don’t forget that the primary motivation of politicians is to stay in office, to get re-elected. Forget “public good”, that is just romance. Public Choice is “politics without the romance” (James Buchanan). One key conclusion of public choice is that changing the identities of the people who hold public office will not produce major changes in policy outcomes. Electing better people will not, by itself, lead to much better government. Adopting the assumption that all individuals, be they voters, politicians, or bureaucrats, are motivated more by self-interest than by public interest evokes a Madisonian perspective on the problems of democratic governance. Like that founding father of the American constitutional republic, public choice recognizes that men are not angels and focuses on the importance of the institutional rules under which people pursue their own objectives. “In framing a government which is to be administered by men over men, the great difficulty lies in this: you must first enable the government to control the governed; and in the next place oblige it to control itself” (Federalist, no. 51). Institutional problems demand institutional solutions. If, for example, democratic governments institutionally are incapable of balancing the public budget, a constitutional rule that limits increases in spending and taxes to no more than the private sector’s rate of growth will be more effective in curbing profligacy than “throwing the rascals out.” Given the problems endemic to majority-rule voting, public choice also suggests that care must be exercised in establishing the domains of private and collective choice; that it is not necessarily desirable to use the same voting rule for all collective decisions; and that the public’s interest can be best protected if exit options are preserved by making collective choices at the lowest feasible level of political authority. For more resources on informed voting, I highly recommend Bryan Caplan’s 2007 book Myth of the Rational Voter. What can we do before it is too late? 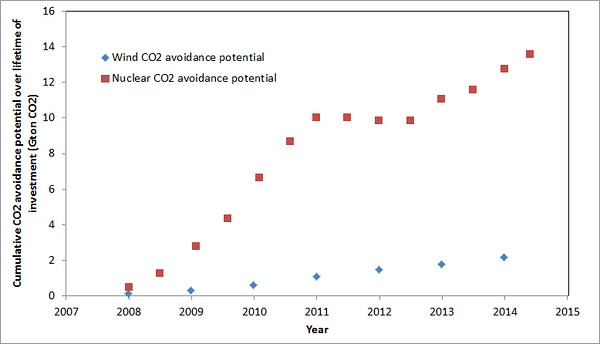 This depressing chart is from Roger Pielke Jr.'s Clean Energy Stagnation. As I’ve been thinking through “what can we do before it is too late?” the easy out is to leave our fate in the hands of China. If current trends continue China, India and their fast-developing brethren nations, will account for the majority of GHG emissions in the next century. China and India are also among the short-list of nations that are actually doing something about decarbonizing. If the west continues “fiddling while Rome burns”, China will eventually offer to sell us the nuclear machines that will allow us to escape from our folly. Actually, it would be wonderful to wake up tomorrow to read that China has already covered our collective frivolous bums, having just closed a turn-key contract to supply Indonesia with 100 new 25 to 500 MWe nuclear plants. That would mean that Indonesia's fast-growing industrial economy will soon have affordable electricity all over the archipelago. But do we really want to just give up, and leave the innovation, engineering, production challenges all to China? Surely the west still has something of value to offer? If we do have useful knowhow, then we would be smart to make the best deals with China that we can before the price of our decaying skills drops any further. If we can create a joint-venture cooperative fast-track with China everybody wins, and westerners can make big piles of money. Maybe even get to create some nuclear jobs and skills back home. Deploying all of the advanced nuclear designs is the best way I know to select out the best tools to end energy poverty while protecting the planet. Consider such as TerraPower, FHR, IFR, MSR, LFTR, PB-AHTR. Reading that short list of innovations – it is so obvious that America hasn't the social capability to deploy even one of them. In the current political state, the Yanks just cannot do it. Given the political will, the Brits, French and Swedes could work together to make a big contribution. Otherwise the energy future belongs to Asia.